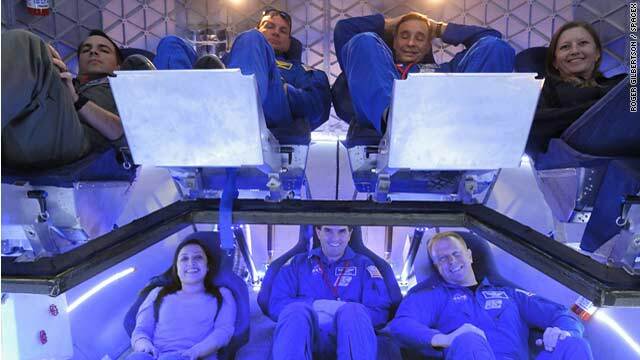 Dragon's test crew, from top left: NASA Crew Survival Engineering Team Lead Dustin Gohmert, NASA astronauts Tony Antonelli and Lee Archambault, SpaceX Mission Operations Engineer Laura Crabtree, SpaceX Thermal Engineer Brenda Hernandez, NASA astronauts Rex Walheim Tim Kopra. If you follow social media or space news, you might have noticed that SpaceX has been showing off its skills lately - first on Mashable.com, which has some great pictures of the Dragon capsule outfitted for a crew of seven, and second on 60 Minutes on Sunday, March 18. SpaceX founder Elon Musk talked to the program about starting and maintaining SpaceX, with some great visuals of the SpaceX facilities and the Dragon itself. This is coming ahead of next month's scheduled test flight of another Dragon capsule atop a Falcon 9 rocket. That launch is scheduled to fly to the International Space Station as part of NASA's Commercial Orbital Transportation Services (COTS) contract. If all goes well, the Dragon will berth with the station. It all sounds great in a vcuaum (ironic pun approved by Dr. Hartings) the private sector has the means, interest, ability, agility, and resources. But, if commercial space travel is anything like commercial air travel, we're in for a whole lotta regulation and needless bureaucratic red tape. I'm talking to you, FAA. As a young entrepreneur, one thing I felt was iamprtont to realize was that my first project is never going to be my last. What I mean to say is that, often creating such revolutionizing companies, need some reputation and resources, which is hard to come by for a bootstrapped, young entrepreneur. I think a young entrepreneur should focus on the objective of increasing his/her credibility and increasing access to resources, and then go for solving the problem he/she is really passionate about. The aha! moment, where do you find out what you really want to do can sometime take several years, so while waiting for it, why not prepare yourself for it. Talk is cheap. So are PR ops. Time for action Mr. Musk!